If there was one Celebration moment that perfectly encapsulated the love fans and creators still have for the Star Wars franchise after forty years, it was when actor and moderator Warwick Davis chose to read the letter he had sent George Lucas after starring in Return of the Jedi. Davis was a self-proclaimed massive Star Wars fan, having seen the first film when he was seven--but he had no idea that five years later Lucas would "give [him] the opportunity to go to that galaxy far, far away and meet [his] heroes" by casting him as Wicket the Ewok. Davis admitted that Star Wars would go on to become an integral part of his life, a sentiment that was echoed by many of his fellow actors over the course of the four-day event. During the 40th Years of Star Wars panel, Harrison Ford referred to joining the film as "the beginning of an incredible ride"; Mark Hamill mentioned that, for him, the role of Luke Skywalker was the role that changed everything. The fondness and positivity didn't stop with the original players, either; the newest additions to the galaxy were unable to hide their delight over getting the opportunity to join the Star Wars family. 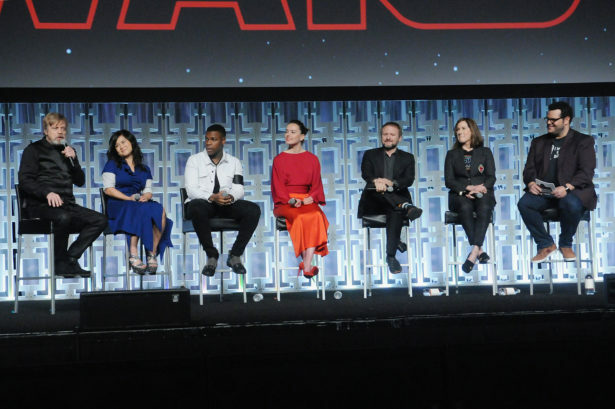 At the panel for The Last Jedi, Kelly Marie Tran made her first public appearance as an official member of the cast, but admitted that she'd actually been at the last Celebration in London as a fan. Making the transition from Star Wars fan to Resistance member Rose was a secret she kept from everyone, including her own family--but Tran said getting to become an official character within the universe was incredible. "You just hear so much excitement and so much love for this thing that you get to be a part of, and I just want to do it justice." Some moments, however, were bittersweet, as this year's Celebration was also the first since the devastating passing of Princess Leia herself, Carrie Fisher. The loss of Fisher wasn't just the loss of a great presence in the world of Star Wars, but also a verifiable cornerstone of Celebration itself. Her daughter Billie Lourd (who also appeared in The Force Awakens) was one among many who pointed out that Fisher would have loved being in Orlando this year: "When she surrounded herself with fans at Celebrations like this, she never felt more at home." In spite of the mourning, there was also a lot of laughter; at his hour-long moving tribute to Fisher peppered with hilarious memories, Mark Hamill said that she was one of the reasons Celebrations were so entertaining, but thanked fans for allowing him the opportunity to talk personally about his "space twin." "This is part of the process I need to move on," he said. "She loved you and I certainly love you, and I need your support, and we all need each other's support to make sure that we honor her legacy in a way that she earned and a way that she deserves." One of the biggest undercurrents of not only the 40th anniversary panel, but really the whole of Celebration, was the sheer amount of affection and love that not only the fans had, but the creators and actors shared in looking back on the franchise. From adorable anecdotes from Anthony Daniels about George Lucas imitating R2-D2 on the set to the moving musical tribute paid to Carrie Fisher and conducted by none other than John Williams himself, the whole thing was a love letter to the enduring legacy of Star Wars. There's a special kind of power that happens when this many people (over 60,000!) come together in one place to focus all their passion and energy on Star Wars, and the end result was pretty incredible to witness. We'd love to hear your experiences at Celebration, or just with Star Wars fandom in general. What makes it special for you? Leave a comment and share your thoughts.